As for the current moment, only students from the University of Washington, Syracuse University and New York University are able to participate in this “social experiment”, while the plan is to add more schools in the future. When i tried to sign up for the service (using Facebook login) i was informed that i am currently on a waiting list and i will receive an invitation “soon”. So.cl seems to have all the regular social networking activities like follow people, share posts (with media), watch friend’s photos and videos. 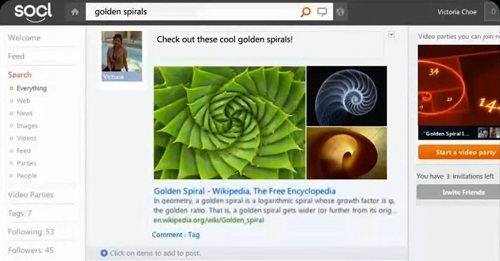 In addition, there are couple of unique features that allows sharing search results or add few visual contents together (similar to Pinterest Pinboard).